We did it again; we splashed out. Now our bank account says zero and we can’t indulge in new trans-seasonal weekend outfits. *Cries. * You’re not alone. All of us at BBHQ are a hundred and one percent guilty of splurging on staying super stylish – especially when there are so many goodies to choose from! So it’s got us thinking, why waste our pocket money, when we’ve got perfectly amazing items hanging in our very own wardrobes? Yep, we’re talkin’ bout revamping our vintage threads, ‘cos who needs to thrift shop, when our closets are already bursting to the brim with delights? We’ve collated the best of the best Summer dresses and freshened them up – so that you’re not feeling like a poor woman before next payday rolls back around! That’s it ladies, assemble to the backs of your wardrobes, rummage through those drawers and pull out your Summer frocks; it’s time to layer it up for Autumn/Winter! You have as many hours in the day as Queen B, who said you can’t slay all season-long too? An essential wardrobe item; she rarely sees the inside of your closet throughout the sunny months. The main feature in every Insta snap on your page, you wouldn’t know a life without her! Don’t keep her stashed away during Winter, just ‘cos the weatherman predicts balmy temperatures. That’s right, let your fave dress see the light of day! Hot on the radar this season, we’re adding a big helping of 90s-infused flavor to our trans-seasonal-wear. We’ve seen the likes of model Kendall Jenner rockin’ the look, so do yourselves a favour and add a plain tee underneath your go-to dress! It’s back to basics, but with a major twist! 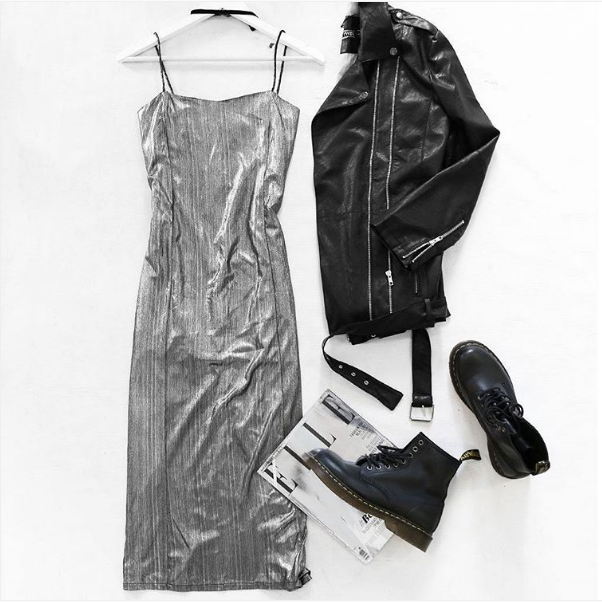 We reckon a grey marle, black or white tee looks super girl-next-door, but a black suede choker and a pair of black ankle boots will give your ensemble a bit of attitude! We can’t think of a better way to dine alfresco, underneath the stars with the girls. So there you have it: the perf Winter-warmer guaranteed to keep you looking stylishly snug ‘til Summer rears its sunny head! What they don’t tell you, is that maxis are also the epitome of trans-seasonal dressing! Take note of their ability to cover almost your entire body length. Yep, make the most of their leg-sheltering factors when the weather outside is frightful! Nothing works better than taking a feminine element and adding an androgynous edge to it. Rocking a cool leather jacket, a vintage denim jacket or a silky bomber will give your floaty silhouette a fiercer personality. Take a walk on the wild side and match your newfound rebellious side with studded boots and silver jewels. Warning: whilst this look is practically perfect for stomping around the weekend markets with your BFFs, this look may actually cause them to riot with sheer wardrobe-envy! We’re talking about cape blazers – or blazers in general for that fact. Simple, minimalistic, modern and timeless. Adding a touch of elegance to your party look with a jacket draped over your shoulders will instantly take your outfit choice to an 11 out of ten. Choose a black, oversized boyfriend blazer for an effortless, just-put-together look, or a structured, longline cape for creating a sense of opulence. With your shoulders kept under wraps, your legs are free to dance the night away – no goosebumps in sight! Uh-huh, there’s no limit to trans-seasonal dressing; you can also upcycle your skirts, tees, and playsuits (your piggy bank will thank you). It’s all in the layering. We’re thinking bulk jackets, cardies, jumpers, shirts, scarves – the possibilities are endless! Wear an A-line skirt to uni paired with a jumper, stockings, boots, and bag. Or rock a cropped tee out shopping, worn with a denim shirt, skinny jeans, boots, and a clutch. If you’ve got it in your wardrobe, it can almost certainly be layered. There’s no need to scrimp and save or go without – the hidden treasure has been right under your nose all this time! Feeling inspired? Check out some of the killer dresses we have online! Where can I find the black playsuit?